I was into studying of heuristic-based exploratory testing approach and methodologies for at least 2 years prior to taking of the course. I took the course in 2011. Blogged about my experiences. I’ve kept broadening and sharpening my skills since then. Blogged about my path as well. 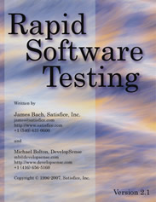 With time, I also gathered a number of observations on people who took or received Rapid Software Testing training. The results are different. Yet I think there’s a pattern, and it points to a problem. Without names and places, I’m sharing my observations below. I ask everyone to contribute their observations. I’d be happy to know that it breaks the pattern I observed. There are two kinds of people: those who deliberately paid to take the RST training and those who were given that at work. First kind includes those who paid their own money or those who worked on getting it paid by employer – so still had it earned. Second kind just received it as a corporate training or was sent to attend the public class that their employer paid for. Ain’t that a sad pattern? And I don’t mean a first part of it. It’s the second part I’m worried about. Again, as I already wrote above: I’ll be happy to learn of the examples that contradict my observations. Please post in comments, your own blogs, or on Twitter. More than that, I want to discuss the ways to change it. Please share your experiences. 2 responses to "How things go with RST takers"
This is quite normal. Learning is something personal. You need to be ready for it. At least when I teach it, it’s a demanding class. Michael is not much less demanding. I’ve had six people walk out of the class in anger in the last two years (that I know of) and all of those were corporate classes. I am trying to crack open minds, but all I can do is create conditions that attract some of the people, some of the time. People who come to public classes have to be personally motivated, though. So, that goes better, usually. Also, corporate classes go better when the manager of the group also takes the class. [Albert’s reply. James – thank you for response. I agree that learning is personal in the sense that every tester needs to make these skills part of their own mental toolset. But, as you also said, learning needs right conditions. Organizations can and should work on this part to make more of the training. And I mean first and foremost the testing managers, arranging the class. I will be following up on the problem. This isn’t just testing specific – you have people who want to constantly learn and grow, and you have people who are very comfortable where they are. People move between these camps all the time as well.